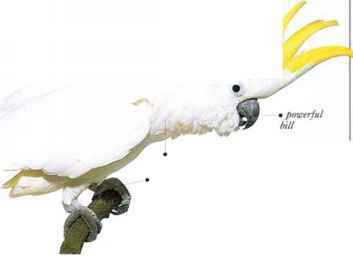 I his large, forest-dwelling cockatoo has a massive bill that can fnce destroy any unprotected wooden structure, whether it be a live tree patch or part of an aviary containing a captive specimen. In the forest, the cockatoo tears open branches to take out the large, wood-boring grubs of moths and beetles that form the greater part of its diet. It also eats seeds, nuts, berries, and blossoms. 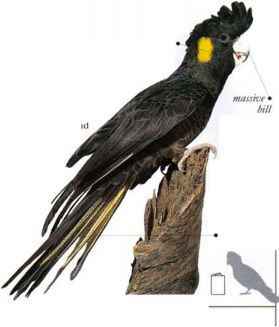 Yellow-tailed Black Cockatoos live mainly up in the trees, roosting and feeding in the branches. They descend to drink at dawn and in the late afternoons. In spite of their size, their slow, flapping flight is light ai bouncy. The birds fly low over the trees in search of good feeding sites, maintaining contact with loud calls. Adults utter a drawn-out. high pitched yell, and juveniles a growling note. The yellow check and tail patches are conspicuous in (light. • Nest a spacious hollow limb or a large cavity in the trunk of a tree, without any lining. E. and S. Australia from S. Queensland as far as Eyre Peninsula and DISTRIBITION Tasmania.